Home BUSINESS EMPOWERMENT Farmers’ partnership with Thika-based Company boosts income threefold. Farmers’ partnership with Thika-based Company boosts income threefold. A section of farmers drawn from Kiambu and Murang'a counties who had attended an organic farming and e-buying workshop held at a Thika hotel this week. 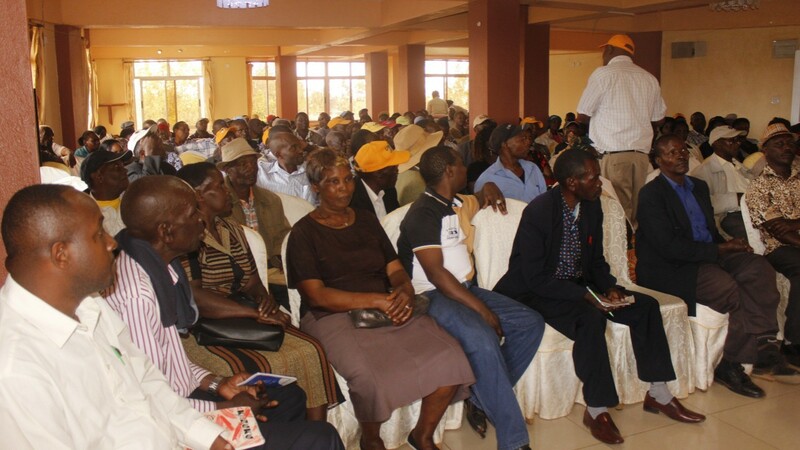 The seminar had been organised by Junglenut Holdings Limited which is based in Thika, Kiambu County. The collaboration between farmers and a Thika-based company has boosted their income to an average three times it has been revealed. In what appears to be a win-win partnership between farmers from Kiambu and Murang’a counties with Junglenut Holdings Limited, the small scale farmers say their association had scaled up their production and eventual sales to as much as thrice what they used to earn previously. Addressing farmers during farmer’s organic and e-buying workshop held at a Thika hotel this week, the company’s J-Hela accounts manager Mr. James Kimotho Gakuya said that their project was aimed at ensuring an increase in productivity and income for smallholder farmers who for a very long time had been exploited by middlemen in the sector. He said that the company had developed a business model with these farmers that aimed at commercialising both macadamia and avocados farming in the region among other horticultural produce through organic farming. He added that they had made efforts in ensuring that farmers received all the necessary assistance they required in boosting their agricultural potentials by ensuring they received the right information at the right time and their produce fetched the best prices in the market. “We always guide the farmers on the best farming methods to ensure that they get good returns. This means also that we have to deliver the best possible prices coupled with the best service, to ensure that the top producers return to us every year,” says Kimotho. To achieve this, the company has created a marketing plan based on comprehensive intelligence of global markets. “We are focused on building markets for the farmers and ensure that they receive their dues promptly and that is where J-Hela comes in handy,” he explained. J-Hela is a mobile banking platform that enables its members to save money, transfer funds, borrow loans and buy products. Members of J-Hela can also borrow loans 3 times their savings. “J-Hela allows us to directly buy produce from the farmers electronically. They receive payments via their phones using this service thus eliminate middlemen. They also make payments through the same platform while paying for farm inputs from us,” said Kimotho. Kimotho added that they have now introduced a loyalty scheme for all their J-Hela members where they earn points for using the service. Dubbed the ‘Jaza Points’, members can be redeem these points for rewards which can be used in company’s purchases thus saving some cash. Stephen Waweru, a macadamia farmer in Gatanga, Murang’a County has been in partnership with the company for the last 3 years and reckons that he has no regrets. Ever since he started working with them, his macadamia production has risen from 100kgs to 500kgs annually which has boosted his income threefold. This, he pointed out, was the prime reason that most farmers in the region were now switching to macadamia and avocado, citing frustrations in coffee and tea farming. Mary Njeri Mwangi says that her association with Junglenut Company had seen her fetch up to Sh. 120 per kilogramme of raw nuts as opposed to sh. 30 four years ago when she had to deal with brokers. She recounted the difficulties of having to meet her basic needs from their coffee proceeds over the years, adding that the new venture presented better prospects. “Each kg of raw nut earns me about sh. 120 with Junglenuts which has helped me recover the losses we suffered from the coffee farming,” she said. For Bernard Mwangi Kinyanjui, an avocado farmer in Muruka Location Kandara Constituency, says that his life changed for the better after experts from Junglenut Company visited his farm and taught him how to grow the Hass avocado organically. “Life has never been the same again for me and my family. If you compare to coffee farming with this variety of avocados, coffee requires more attention and is harder to sell to the market, even if it costs less than avocados,” he said. According to Mwangi, Hass variety has a longer shelf life which makes it more suitable for the export market. He adds that unlike the other varieties which fall to the ground when they ripen, this one is disease-resistant and remains on the tree even after it is ripe. He adds that working with Junglenuts eliminate middle men and brokers and their idea of clustering the farmers had helped them grow as farmers and maximise their production. “Junglenuts introduced us to organic farming and opened us to numerous market opportunities. Our avocados are normally priced 20-30% higher than conventional ones notwithstanding that organic farming normally involves low capital investment,” explains Mwangi.